The remote and mysterious Makgadikgadi Pans are a place to feel gloriously free. This five night/six day safari on horseback follows the meandering shoreline of this ancient lake bed with the most perfect ground for exhilarating riding. Early explorers such as David Livingstone ventured this way and the likes of Frederick Courtney Selous intrepidly hunted the area on horseback. Since their time this extraordinary landscape, with the Pans disappearing into the distant heat haze, little has changed. During the dry season you will ride at a fast pace into the heart of the Pans and traverse the adjoining grasslands and woodlands where the full waterholes attract the last surviving migration of zebra and wildebeest in southern Africa. 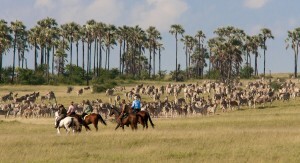 Imagine riding with more than 30,000 zebra scattered over the grasslands as far as the eye can see! Amongst all of this lives the fascinating desert adapted wildlife - meerkat clans, brown hyenas and aardwolves and who better than the Zu/’Hoasi Bushmen to interpret the life around us. Three days are spent riding out of Camp Kalahari, a delightfully relaxed traditional tented safari camp on one of the palm thronged islands after which we spend two nights in a remote fly camp or on bedrolls under the stars. Request Full Itinerary & Price - Includes; camp accommodation, meals and drinks, riding, transfers and flights to camp from Maun.